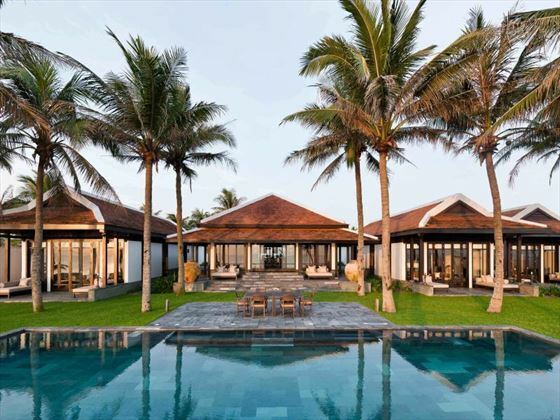 Situated on the mid eastern coastline of Vietnam just five miles north of the UNESCO World Heritage Sites and regional cafés, bars and restaurants of Hoi An. 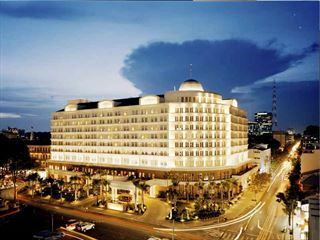 Da Nang International Airport is approximately a 20 minute drive from The Nam Hai. One Bedroom Villas – one king-size bed or Hollywood twin beds and a large luxury bathroom which opens onto a private garden with an outdoor shower; suitable for three adults or two adults and one child. One Bedroom Beachfront Villas – same arrangement as above with direct access onto the beach via a private outdoor terrace. One Bedroom with Pool Villas – three times the size as above villas with living and dining pavilion, separate king-size or twin bedroom, private pool and additional Club benefits, which include*: check in and check out services, butler services, daily afternoon tea, complimentary drinks and snacks, minibar replenished daily, and laundry service. 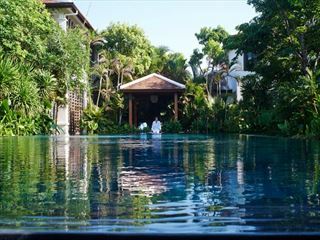 Two Bedrooms with Pool Villas – much larger than One Bed with Pool Villas with two bedrooms, free form swimming pool, living and dining pavilion and Club privileges*; suitable for six adults or four adults and two children. 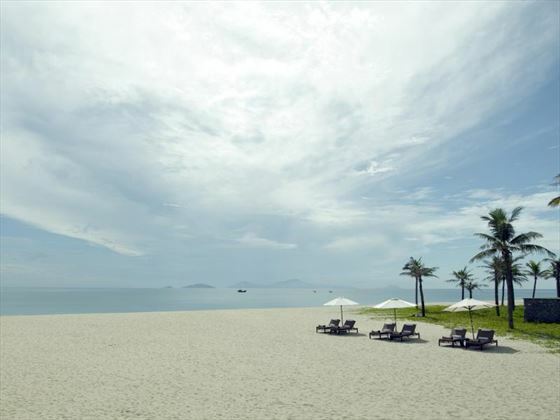 Three Bedroom with Pool Villas – larger than villas mentioned above with either a hilltop, ocean view or beach front location. 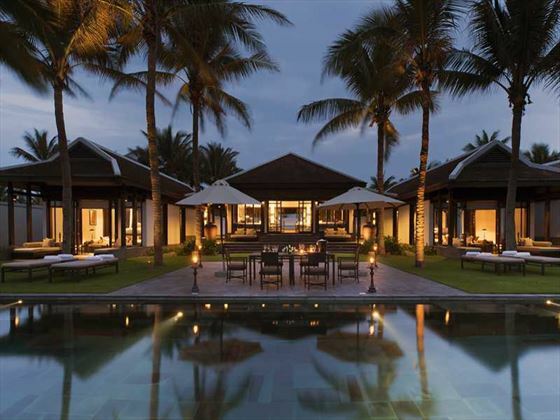 Three Bed with Pool Villas contain three bedrooms that open up to terrace and garden areas which feature a private pool, lotus ponds and outdoor lounge and dining space. These villas also allow access to Club benefits* and are suitable for nine adults or six adults and three children. Four Bedroom with Pool Villas – larger than Three Bedroom with Pool Villas with similar features, including Club* access, as well as an extra bedroom to sleep 12 adults or eight adults and four children. 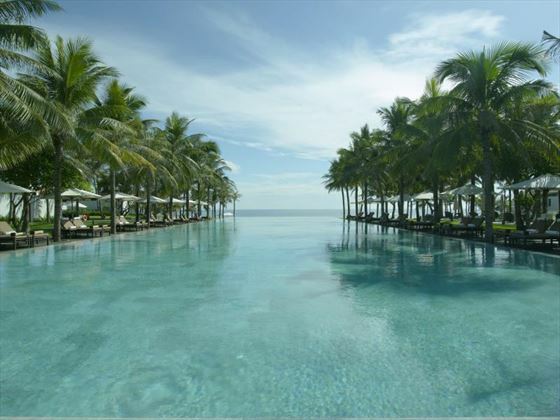 Five Bedroom Beachfront with Pool Villa – the largest property in resort with enough dining, lounging and sleeping space to accommodate 15 adults or 10 adults and five children. 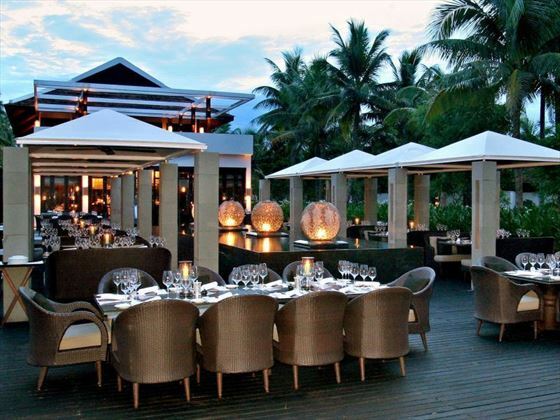 The Restaurant – beautiful wooden carved dining facility for breakfast and evening meals with the emphasis on Indian and international fusion cuisine. The Beach Restaurant – an open air café to enjoy a good choice of pizzas, burgers, salads and Vietnamese favourites by the pool; open from 11am until 10.30pm. The Bar – upper level wooden bar with balcony, piano and signature cocktails from 9am until 1am. Dining Events – take a culinary master class as you follow the Chef from the resort garden to dining table or enjoy a romantic meal for two on the beach at sunset. 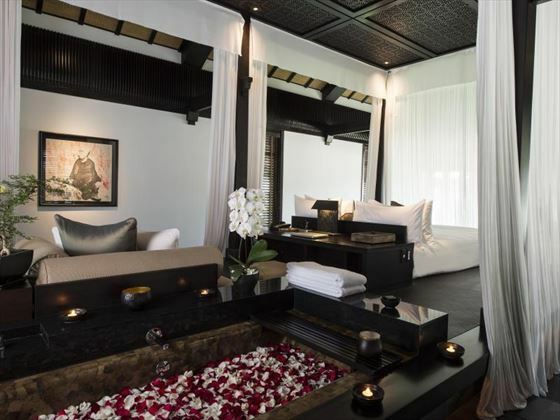 The Spa – eight treatment rooms surrounded by lotus pools and fish filled lagoons for a full range of pampering and well being services. The Health Club – basketball, badminton and tennis courts; gym suite, jogging paths and Yoga sessions. Kids' activity villa for a choice of organised and supervised cultural, educational and fun activities for children aged between 4 – 6 or 7 – 12 years of age.